Former UFC featherweight and lightweight champion Conor McGregor will return to the octagon for the first time in nearly two years at UFC 229 this Saturday night in Las Vegas. The brash Irish superstar will be returning for arguably his greatest challenge to date in the form of undefeated current UFC lightweight champion Khabib Nurmagomedov. “The Eagle” has gone a perfect 26-0 in his mixed martial arts career and currently stands as a slight betting favorite to defeat Conor McGregor this Saturday night at T-Mobile Arena. The undefeated Russian has proven to have elite wrestling skills, this while also possessing some of the most brutal ground and pound ever seen in mixed martial arts. Because of these traits, many fans and analysts believe that Khabib Nurmagomedov is a stylistic nightmare for Conor McGregor. The truth is that the current UFC lightweight champion, Nurmagomedov is really a terrible stylistic matchup for any fighter. But we aren’t talking about “any other fighter” here, we are talking about Conor McGregor. We are talking about the UFC’s biggest superstar. A man who has made himself a legend based on his ability to not only “talk the talk” but to also triumphantly “walk the walk”. 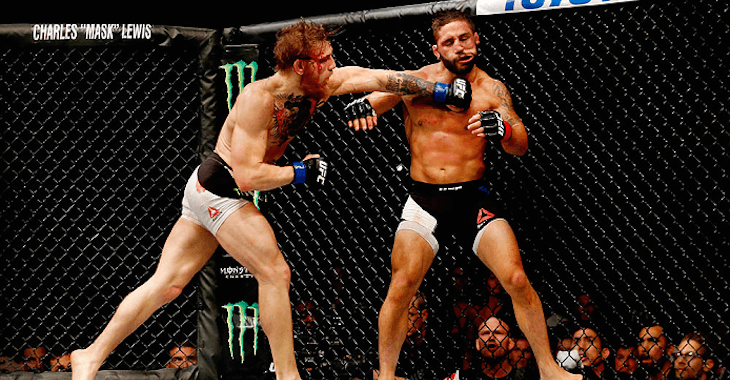 Conor McGregor has defied the odds and silenced his critics on multiple occasions during his now storied UFC career. It was thought by many that even as a short-notice replacement, Chad Mendes would be able to utilize his strong wrestling abilities to defeat Conor McGregor when they fought at UFC 189. While “Money’s” grappling proved to be effective in the early moments of the fight, Conor McGregor would eventually get back up to his feet and when he did the fight did not last long. 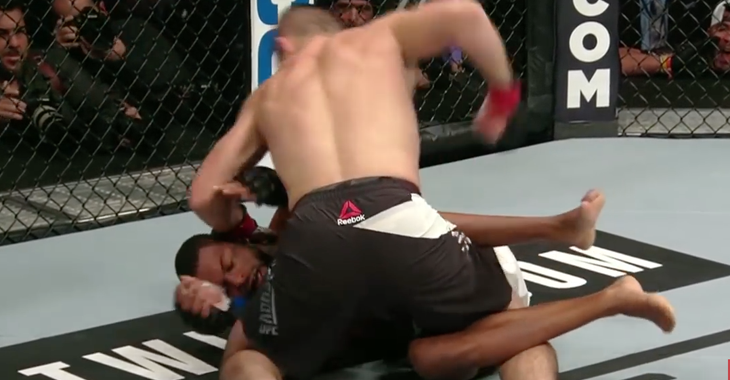 McGregor proceeded to find a home for his patent left hand on frequent occasion which inevitably sent Mendes crashing to the canvas. While many fans will justly point to Chad Mendes’ short training camp for the loss, there is no question that Conor McGregor proved that he is capable of fighting through adversity in his bout with “Money”. 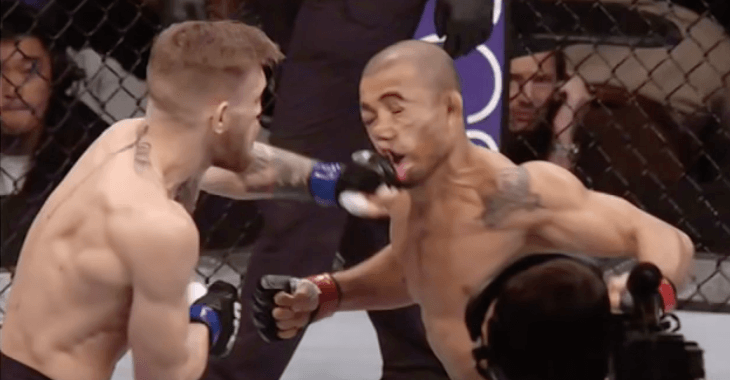 Following his win over Mendes at UFC 189, Conor McGregor was pitted against MMA legend Jose Aldo at UFC 194 in a bout for the promotions undisputed featherweight championship. Once again, many fans and analysts (myself included) believed that the longtime Brazilian champion, Aldo, would simply be too much for the bold young Irishman. What happened next would turn the mixed martial arts world on it’s head. Conor McGregor proceeded to knockout Jose Aldo with one punch just thirteen seconds into their main event showdown at UFC 194. It was one of those moments where you had to pick your jaw up from off the floor. Something that seemed almost impossible to do at the time, defeating Jose Aldo, and doing so in just 13-seconds. It was simply mind numbing. His ability to defy the odds, along with his brash personality has made Conor McGregor a household name. After falling just short in his latest conquest to defy the odds, a boxing match against undefeated legend of the squared circle Floyd Mayweather, fans and analysts alike now eagerly await to see what “Mystic Mac” has in store for us this time around at UFC 229. This weekend’s Conor McGregor vs. Khabib Nurmagomedov is being touted by many as the biggest fight in mixed martial arts sports history. Whether or not that is actually true is simply a matter of opinion. However, there is no denying that due to the fascinating stylistic matchup, along with the pairs heated public rivalry, Conor McGregor vs. Khabib Nurmagomedov is definitely the biggest MMA fight in recent memory. Conor McGregor has gone from being a plumber in Dublin to arguably the most recognized prize fighter on the planet in less than a decade. So even though the odds are not quite in his favor at UFC 229, don’t dismiss the luck of the Irish. Do you think Conor McGregor will once again be able to defy the odds and hand Khabib Nurmagomedov the first loss of his mixed martial arts career at UFC 229? Be sure to come watch Saturday’s blockbuster UFC 229 pay-per-view event live at one of Kauai’s Kalapaki Joe’s locations!